Gus Van Horn: Yes. We Should Privatize the Post Office. Yes. We Should Privatize the Post Office. This cut-rate selling-of-the-farm culminates a tepid cost-benefit analysis typical of far too many allegedly pro-free market economists and pundits. At times, Shaw sounds like he thinks the Post Office can stand on its own two feet, but he basically agrees with Senator Claire McCaskill (D-MO) that: (1) There would be no way for rural people to receive mail and parcels without the government backing the Post Office; and (2) This somehow entitles rural residents to benefit from whatever arm-twisting or back-door loot the government-created postal monopoly provides the post office. The "significant upside" Jazz Shaw can't see or won't discuss would require dropping the altruist-collectivist premise that one man's need is another man's indenture. Even little concessions -- like a government postal service that doesn't cost all that much -- set moral and political precedents for the government to make more numerous and more meddlesome demands and prescriptions all the time. That's what makes them so dangerous. 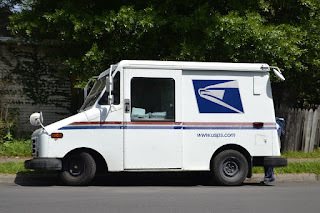 So, the "significant upside" of privatizing the post office, done properly, is that it would be a small step towards once again securing our liberty as Americans, regardless of what any analysis of the current viability of the postal service might have to say. The postal service can find a way to survive or something(s) better can replace it. (FedEx? The phone? Occasional drives into town? More rural stores? Email? There is no one way to receive packages or information.) What shouldn't happen is for the government to force Jack to pay directly or indirectly to solve Fred's problems. It is past time for those of us who value our individual rights to ask whether to privatize the post office (among many other illegitimate government agencies), and move on to the questions of when and how. Whatever the merits of Trump's plan (including whether it truly is a privitazation), it does at least bring this issue to light. Along with it, we can see that perhaps the biggest obstacle will come from unprincipled or cowardly "allies" on the right -- who can't or won't make a stand against those who would chip away at our freedom. When people call for socializing health care because other Western nations have done so ('everybody's doing it', essentially), I always want to ask them if we should probatio privatize the post office for the same reason. The same people who use that argument with respect to health care are usually the ones most likely to object to using it when it comes to mail delivery. That's a fun and possibly thought-provoking suggestion. This reminds me of the fact that Denmark, one of the countries the "democratic socialists" say they want to emulate, ranks higher than the US in several measures of economic freedom. So these people think FedEx and UPS don't deliver to rural areas? It's a bit less convenient in some places--I know places where you have to go to the office to pick up packages, for example--but that's hardly an insurmountable problem, evidenced by the fact that it is happening all over the country right now. Also, what does the USPS deliver these days? Most people pay their bills online, either without receiving a bill in the mail or before they receive it. Most people ship packages via UPS or FedEx. When I open my mailbox today I'm going to see abut two pounds of junk mail addressed to "Dear Resident", and that's it. What these people are advocating for in fact, in reality, is forcing us to subsidize the junk mail flier industry!